Okinawa is the tropical southernmost prefecture of Japan. The prefecture consists of about 160 islands, which are scattered over a 350-mile-long area. The main regions are Okinawa Honto (the main island of Okinawa), Kerama Shoto (the Kerama Islands), Kumejima (Kume Island), Miyako Shoto (the Miyako Islands) and Yaeyama Shoto (the Yaeyama Islands). A population of about 1.4 million lives on 466 square miles of land scattered over these islands. The people live in near-perfect tropical conditions, where the average temperature is 73.4 degrees F (23.1 C) and a single rainy season lasts from early May to mid- or late June. By day they swim in turquoise waters off broad, sandy beaches; by night they dine on fresh pineapple under starry skies. These paradisiacal islands in the East China Sea between Taiwan and the Japanese mainland, are a place where many have dreamed of living. On a map, the major Okinawa islands look a little like a long disjointed tail off southern Japan that whips toward the southwest. Naha, the capital, lies roughly at the center of the group in southern Okinawa Honto, the largest island. Kume, known as a resort island with beautiful beaches, is about 60 miles west of Okinawa Honto. Look about 180 miles southwest of Okinawa Honto and you'll see Miyako Island. 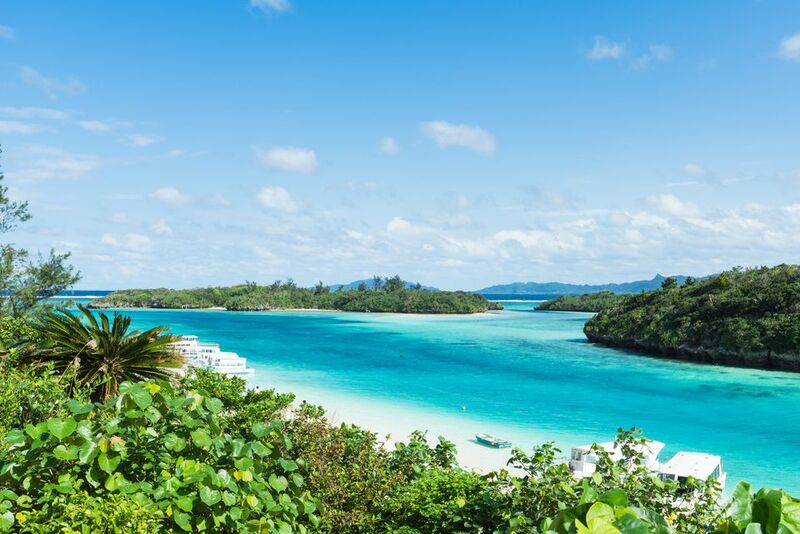 The third largest island in the prefecture is Ishigaki at 250 miles southwest of Okinawa Honto; the small island of Taketomijima nestles up to Ishigaki. Follow this line to the west of Ishigaki Island, and there is Iriomote Island, the second largest in the Okinawa prefecture. Unlike other parts of Japan, the islands of Okinawa have their own history. Hundreds of years ago, they were populated by the Ryukyu; from the 15th century, the Ryukyu Kingdom flourished for more than 400 years. Japan took over, integrated the Ryukyu into its society and in 1879 changed the name of the islands to Okinawa prefecture. During World War II during the famous Battle of Okinawa, civilians were involved in the fighting. Okinawa was under the control of the US Military from the end of WWII to 1972. Today, major US military bases remain in Okinawa. And the people preserve many traditions of the Ryukyu Kingdom, from language to arts and music. Flying is by far the fastest way to travel from major Japanese cities to Naha. By air, it's about two and a half hours from Tokyo Haneda Airport and about two hours from Kansai Airport/Osaka International Airport (Itami) to Naha Airport, although flights from other Japanese cities to Naha are available as well. Yui Rail, a monorail service of Naha, runs between Naha Airport and Shuri, a district of Naha that's the former royal capital of the Ryukyu Kingdom. Well-known historical sites from the Ryukus' heyday, such as Shuri Castle—palace of the Ryukyu Kingdom from 1429 to 1879—remain as UNESCO–designated World Heritage Sites.